I love it. Made completely from driftwood, this display is efficient and gorgeous. 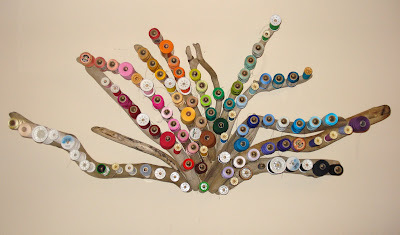 How do you store your spools of thread? There is a photo in this post of my spools of thread...they are held in an antique printer's drawer. It looks great hanging on the wall and everything is easily accessible! Hi, I'm Anna Rose! Through creative means and a little elbow grease, I believe anything can be beautified. Join me in my journey to transform the ordinary into one-of-a-kind treasures. Copyright © 2013 The How-To Gal · All Rights Reserved. Picture Window theme. Powered by Blogger.